When I plan a holiday meal, I pull out all the stops when it comes to dessert. This multi-layered Chocolate Fudge Layer Cake is definitely a showstopper! This is no ordinary chocolate fudge layer cake. There are FOUR layers of cake filled with silky ganache and chocolate meringue buttercream frosting. 30 ounces of chocolate, over a pound and a quarter of butter, a cup of heavy cream and 9 eggs. Warning: your kitchen will be a mess of chocolate bowls and implements by the time this gem is filled and frosted. Even Izzy was splattered with frosting when my offset spatula flipped off the counter top and landed on her back. She hovers when I bake. I bet you can see why. BUT the result is one exquisite, extremely decadent, better-than-bakery cake! This fudge cake is perfect for what ever holidays you celebrate this fall, winter and throughout the year. I hate to admit this, but I often make two desserts for our family of 5 on the holidays. Mainly it’s because the guys, meaning my hubby and two grown sons, want something chocolate. Katie and I aren’t quite as rigid, so we can go peanut butter, vanilla or even red velvet. But the most thought goes into the chocolate recipe. Lava cakes and French silk pie make the cut quite frequently, but I also love to peruse my cookbooks for a new idea. I found an espresso fudge layer cake in Marcel Desaulniers’ Death by Chocolate cookbook, but it was loaded with coffee undertones. The hubby’s persnickety palate would not be a fan. The espresso needed to be toned way down. The result was a sublime creation. 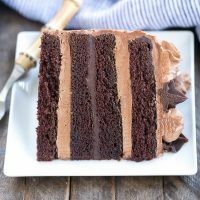 I really tried to restrain myself, but this Chocolate Fudge Layer Cake was one amazing, irresistible cake! Spray two 9-inch cake pans with non-stick oil and flour spray like Bakers Joy. Whisk together the 2 cups of flour, the baking soda, and salt in a medium bowl. Set aside. Combine the brown sugar and 8 tablespoons soft butter in the bowl of an electric mixer fit with the paddle attachment. Beat on low for 3 minutes. Scrape down the sides of the bowl, then beat on high for 2 minutes. 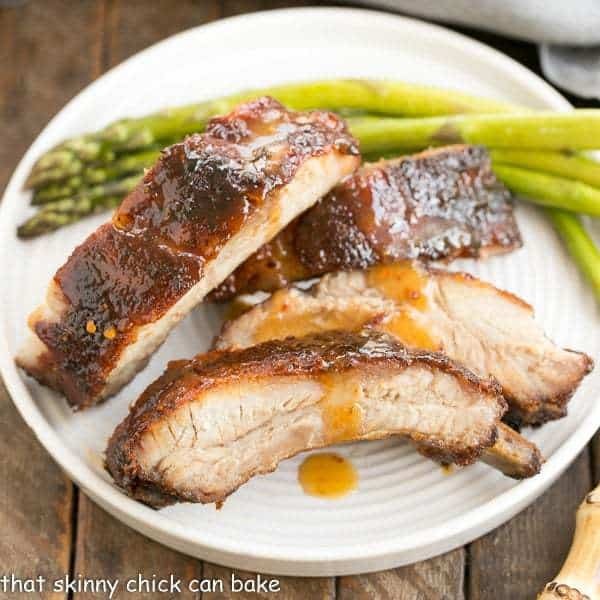 Scrape down the sides of the bowl again and beat on high for another 1½ minutes. Microwave 1 cup of water until near boiling in a microwave safe Pyrex measuring cup. With the mixer on low add a third of the flour mixture. Mix, then add ½ cup sour cream; allow to mix for 30 seconds. Add another third of the flour and the remaining sour cream and mix for another 30 seconds. Add the remaining sifted flour and the boiling water and mix for an additional 30 seconds before removing the bowl from the mixer. Use a rubber spatula to finish mixing the batter, until it is smooth and thoroughly combined. You do not want to over-mix. Pour the cake batter into the prepared pans, dividing it evenly. Smooth the tops with an offset spatula. Bake until a toothpick inserted in center comes out clean, 45 to 50 minutes. Remove the cakes from the oven and cool in the pans for 15 minutes at room temperature. Remove cakes to cooling racks and refrigerate until needed. Fill a pastry bag fitted with a medium-sized star tip with remaining ganache. To decorate the cake, first pipe a ring of the buttercream stars around the outside edge of the top of the cake. Then pipe a circle of ganache stars (each star touching the other) inside the ring of buttercream. Alternate the rings of buttercream stars and circles of ganache stars, until the entire top of the cake is covered. Refrigerate the cake for at least 1 hour before cutting. 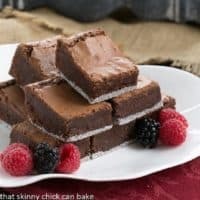 If you’re looking for more chocolate cake recipes (I always am!! 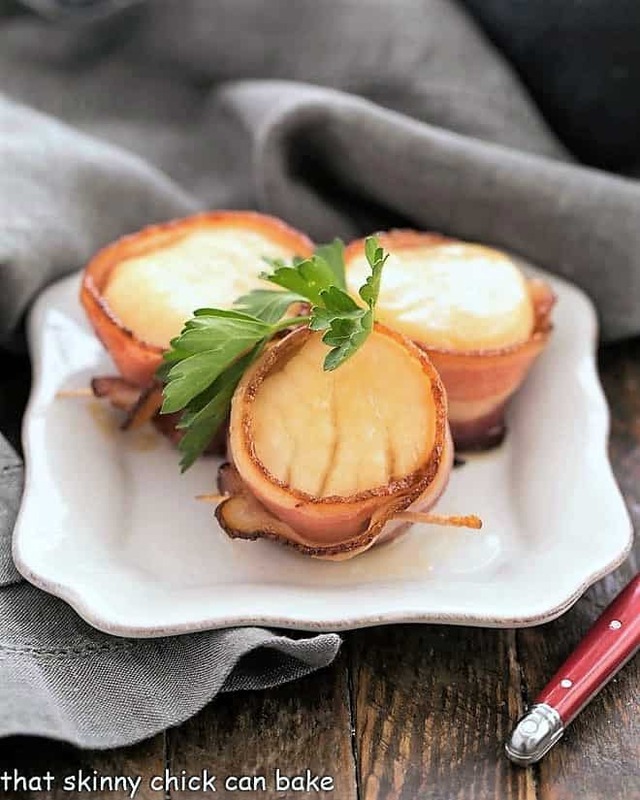 ), here a few delicious options from some blogger friends! I’m actually speechless. This is gorgeous but it looks so mouth watering good!!! I have a huge sweet tooth and I had a piece of this right now I would eat it for breakfast. that filling alone looks scrumptious no less the cake wow showstop it is for sure! 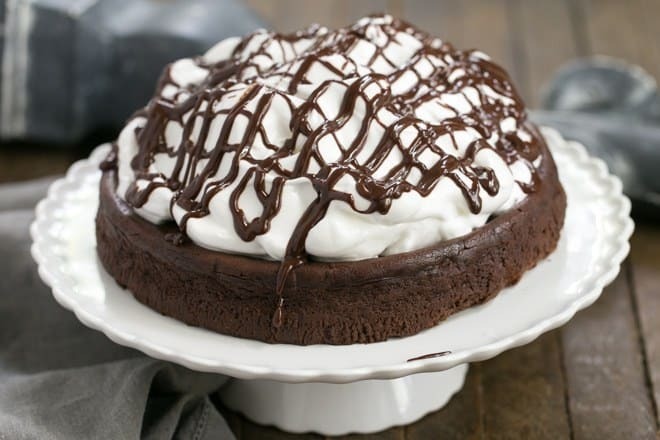 When I was little I remember eating a Pepperidge farm fudge mousse cake (my family was moving over someone’s bday–so that was last ditch effort to have cake) and I fell in love. I have since wanted to have it, but it is so full of junk! This is reminding me of that cake and I so want it!! A showstopper it definitely is – looks so amazingly good, and you’ve iced it to perfection! That’s a stunner, Liz! You are a baking queen! That cake is GORGEOUS! I’d totally eat the whole thing by myself, chocolate cake is my favorite! This cake looks like perfection! I’m sure it’s worth all the dirty dishes. Quick question: is there a particular bloggy reason you remove the link to your post in the lineup? Your cake is fabulous and it looks delicious! What a dreamy cake, Liz! I just love the surprise layer of ganache in there, it must be so decadent. A perfect treat for the holidays. Thanks, Leef! It tasted even better than it looked!! I happen to think all your cakes are showstoppers. This one is a crowd pleaser, I’m sure. What a gorgeous cake! I totally get making 2 desserts for 5 people, you want to make everyone happy. I’d be very happy with this cake! Oh my goodness!! This cake is absolutely stunning, Liz! 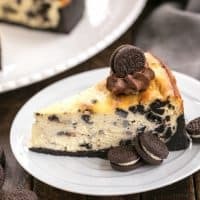 What an incredible dessert for the holidays! My hubby and stepdad are the chocolate cake fans in our house too and I can’t wait to make this for them! The layers are perfect and I love the chocolate ganache in the middle! My very favorite dessert is chocolate cake! The batter for this is the same as mine, but I just use a simple buttercream instead of the ganache. Jeez Liz. Now you have my mouth watering and thinking I should make a belated birthday cake for Manservant when he arrives home. Only now there will be just two of us, which means a lot of cake! Well, that’s the way the cookie crumbles! This cake is so beautiful Liz, I can never cut a cake as well as you, each slice is perfect. That aside this is an amazing looking dessert and I’d love a slice. This cake looks amazing! Quick question – the pictures all look like there are 4 layers of cake, and the instructions refer to 2 cakes (each cut in half horizontally) in some places, but you mention that it is a 6-layer cake, plus instruct to prepare 3 cake pans. Should the cake batter be divided among 2 cake pans or 3? I just want to make sure I don’t mess anything up! Thank you! Oh, my gosh, thanks for catching that, Jennifer! That’s what I get for typing up this post when I was sleep deprived. It is a 4 layer cake (2 layers cut in half like you said). I’ve edited the recipe and will read it over one more time for accuracy. Let me know if you have any more questions! 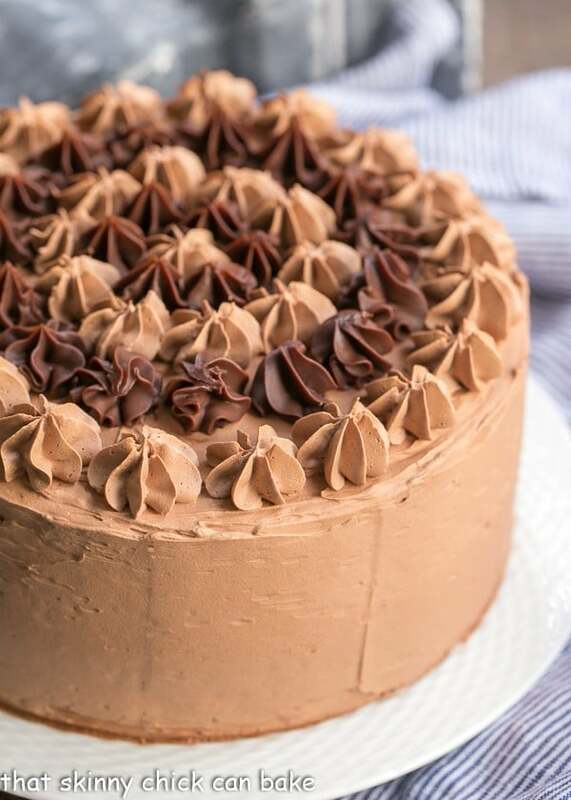 Guys here are chocolate lovers as well…this cake would win their vote for sure. If I make two desserts it would be so that I could have some…lemon or strawberry or vanilla always get my vote. You make such beautiful desserts. Hi, Alison, YES, you definitely can make the cake layers ahead of time. I’d wrap them well in plastic wrap and store them in the fridge overnight. They should be fine! Hope you enjoy!!! OH, Liz! My mouth actually fell open when I saw this–it looks GORGEOUS. The four layers are everything!! 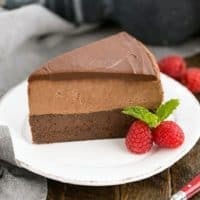 I can name so many folks who would appreciate this cake right now–I often make two desserts as well to accommodate for tastes, so I’ll be bookmarking this one for the chocolate lovers! 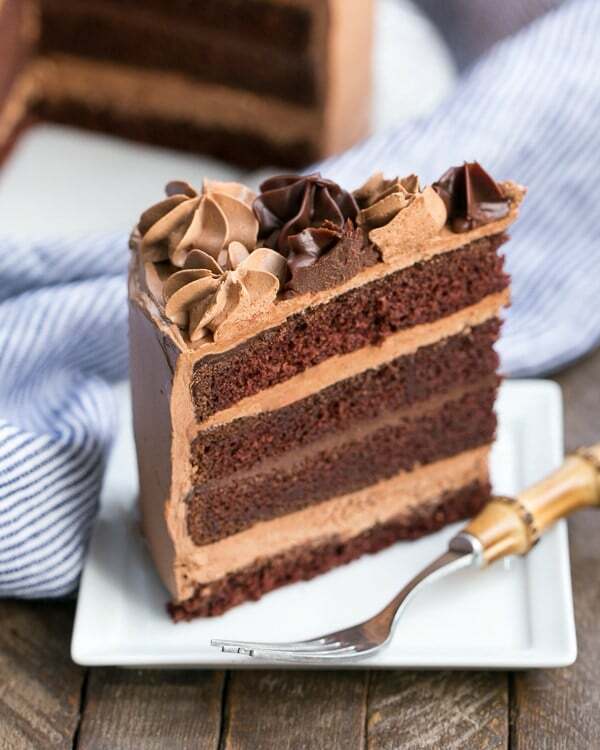 Be still my heart.. this chocoholic is in dire need of a slice of this fabulous cake! This looks divine Liz! One of these holidays I will show some restraint and only make two desserts. For Thanksgiving, it’s usually 3 or 4. When everyone is home for Christmas it’s not unusual to have 5 or 6, and they eat them all! This cake is chilling in the fridge as I type. Looks amazing flavours taste great individually. Can’t wait to try a slice! Serving it tonight for a special birthday. Instructions were easy to follow. We now have a new go to chocolate icing receipe!!! I’m in love with that buttercream, too! So glad you gave this recipe a try!!! Woah! This cake is a thing of beauty! Just pinned! Gorgeous, Liz! All I know is I want to spend the holidays at your house!! Hi! 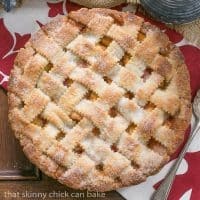 I’m so excited to bake this for Thanksgiving. I’m looking at doing it in a couple days- cake layers one day and assembly/icing the next. Am I able to freeze the entire cake after decorating? I don’t have any experience with this type of buttercream and worry about it falling/not setting. I feel as if it would be in my fridge too long before the big meal (possibly decorating on Sunday and eating Thursday). Hi, Hannah, I haven’t tried freezing this cake, but I DO think it will freeze just fine. I’d refrigerate to set the frosting, then double wrap and freeze. I agree that it will stay fresher that way—what a great idea to make ahead so you can have a show stopper for Thanksgiving! I’ve got this cake in the oven right now and am so excited. My batter was thinner than most cakes I’ve made before so hoping it thickens up in the oven. Oh. My. Gawd. That looks absolutely delicious and beautiful! It’s been pinned, obviously and I would love for you to share over at the new Let’s Party! https://themarkandjanshow.com/2018/01/31/lets-party-6/ … we look forward to seeing you there! Is the sugar in the buttercream … white sugar or icing sugar?? Just regular old granulated white sugar. Hope you enjoy—it’s a lot of steps, but a delicious cake in the end! I am on chocolate overload!!! Love the ganache layer between 2 lighter layers of buttercream… my mouth is watering! Loving those beautiful layers! So perfect for a friend’s upcoming birthday! Oh my gosh this cake is amazing! I forgot to come here and tell you how much everyone loved this cake! I made it for Father’s Day and everyone loved it! cake is amazingly delicious, sinful, rich and decadent. But would I make it again. No. I looked at the picture and thought perfect for a co-workers chocolate lovers birthday. Sunday I printed the ingredients and went shopping. Monday I read through the recipe and thought what did I get myself into? I made it over 3 days after work. Tuesday was the frosting filling night. It was 2 hours of melting in double boiler to cooling and back and forth. I didn’t have that many large mixing bowls. It was worth all the work with the endless raves I got today. But man, I’m too old for this much work. LOL, I feel your pain, but I’m also so proud of and delighted for you!! Thanks for taking the time to comment and congrats on a job well done!!! So fudgy and decadent, the perfect special occasion cake! This cake is spectacular! It came out just like the pictures, thanks so much for such an easy to follow recipe! Wow, I’m totally making this for the next birthday coming up in my family! Oh. My. Gosh. This chocolate cake is the queen of all cakes. So good! This is to die for! Those layers! 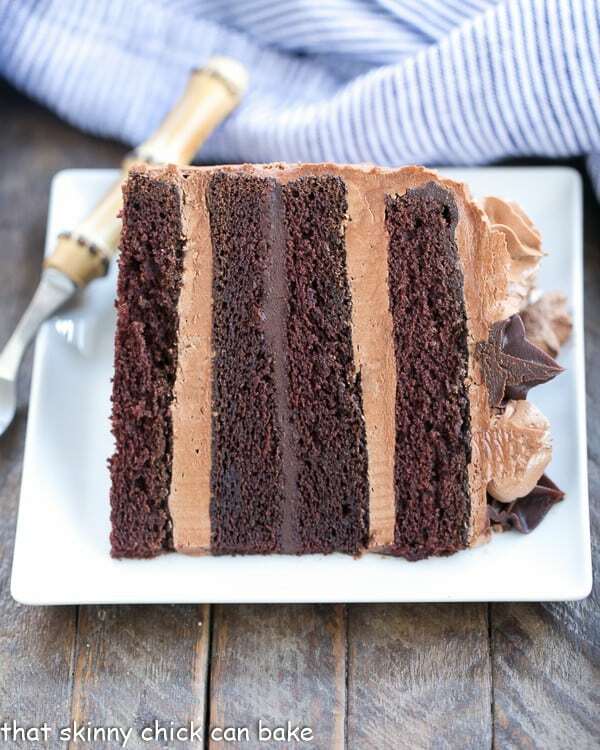 This could not be more perfect for my chocolate loving self – those layers are everything! oh my!! Be still my heart. 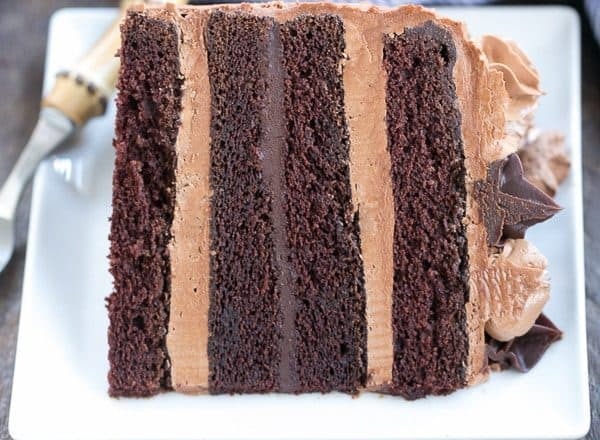 Layers and layers of chocolate goodness! Simply to die for. This taste really good! A big hit in my house! The silky chocolate ganache really makes this one special. This cake is so moist and elegant! My guests loved it! 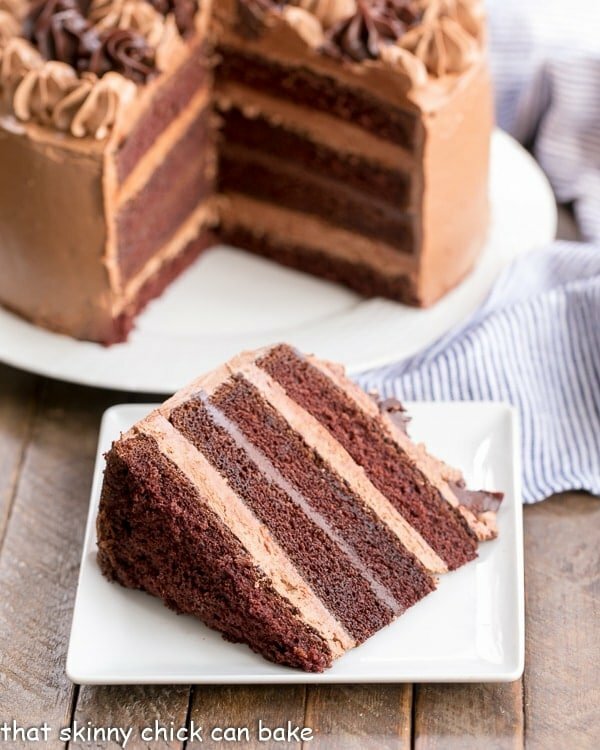 This is chocolate layer cake perfection! Hi there. So excited to make this tomorrow! Clarification on the butter… salted or unsalted? I always use salted butter, but if you want to use unsalted, just add a touch more salt to the recipe. Hope you enjoy, Kim!! !